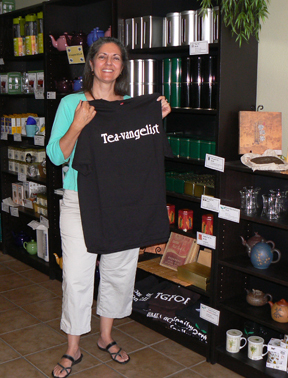 For her Coffee CommuniTea (CCT) blog, Ann had visited the Souvia Tea Shop and had found this perfect tea-shirt. Ann explored the Souvia Tea Shop for her Coffee CommuniTea blog and discovered this perfect tea-shirt. My main pet peeve when editing involves the overuse of passive voice. I don’t mean past tense, where you’re describing things that happened before. But passive voice, which uses far too many “to be” verbs and far too few active verbs. Passive verbs = is leaping, are creating, have experienced, was learning, were thinking, have been choosing. Active verbs = leaps, create, experienced, learned, thought, chose. Passive: The voice was mesmerizing to the student. Active: The voice mesmerized the student. Passive: The young girl was overwhelmed by the depths of the woman’s presence. Active: The woman’s deep presence overwhelmed the young girl. Employ these two tips alone and just watch your writing become much more effective! Tell me about your main editing pet peeve. This entry was posted in All Posts, Words: Serious Play, Writing tips and tagged active voice, passive voice, Videan Unlimited, writing tip by Ann Videan. Bookmark the permalink. Can’t think of a peeve, but love the humorous demonstration of the tip! One of my pet peeves – and this really makes me crazy – is when someone uses literally to emphasize something that is not (almost certainly) literal. Thank you, Joanne. I hope to use a fun photo caption to demonstrate all my writing tips. Wish me luck!